Hillarys Pen Available! Built in South Africa to perform in harsh conditions, these T Craft catamarans are a perfect match for our coastline. This 32' model was built with speed and stability in mind, aided by a pair of 2009 MTU diesels linked with Castoldi jet drives. The MTU 350HP power units were installed new in 2009 and have since done just 320 hours. "Il Gatto" gets along quickly at 30 knots and economically cruises at a brisk 20 knots. The cockpit space is something to be marvelled at due to the beam of this vessel and the favourable forward positioned saloon. You will be hard pressed to find a 32' vessel with this much usable space! Accommodation comes in the form of a double bunk to each hull and a single down the port side. The starboard hull hosts the simple galley and head/shower. The saloon is spacious and has a large bi-fold door, accompanied with a removable window to allow plenty of airflow throughout the vessel. A sizable TV facing aft will be handy for watching the footy whilst relaxing on the back deck. 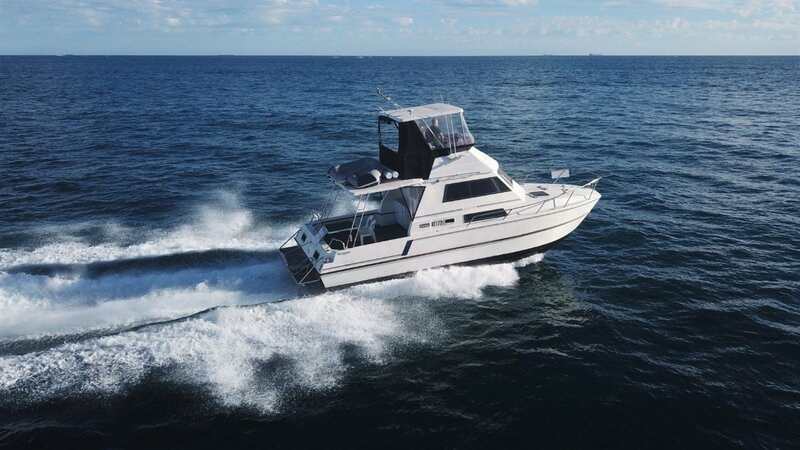 The flybridge helmstation offers uninterupted vision for the skipper and a great vantage point for navigating those tricky bays at Rottnest and the Abrolhos. The loving owner has just finished refurbishing the cockpit galley and bench tops which really sets off the outdoor living space on the vessel. If you are in the market for a Leisurecat, Powercat, Kevlacat, Cougar Cat, this should not be dismissed as a strong contender for your next boat. For more information, please contact Tom or Matt Lovelady on (08) 9243 6373 or email sales@oceaneermarine. Com. Au. - Simple, clean and tidy jet driven vessel. accomodationDouble berths in both hulls plus a single on the port side.